Sequester: Republicans uncertain about future cuts. 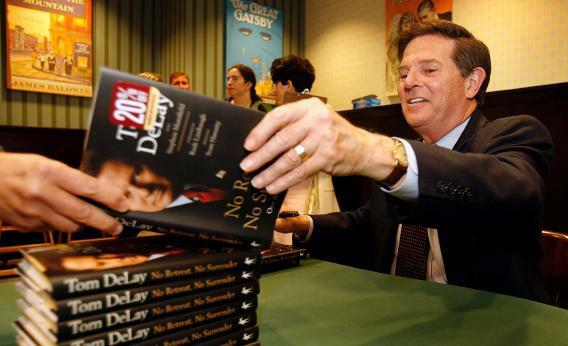 Former U.S. House Majority Leader Tom DeLay prepares to sign a copy of his book “No Retreat, No Surrender” March 27, 2007 in Sugar Land, Texas. - $1.2 trillion is scheduled to be cut from the defense budget and parts of the non-defense budget. We have a clear idea of what would be cut if this goes through. - The “fiscal cliff” deal delayed the sequestration cuts, scheduled to begin January 2, to March 1. Republican leaders are convinced that doing this “de-coupled” the cuts from tax increases. “Revenue is over,” as Mitch McConnell put it. But de-coupling the cuts from taxes put Republicans back where they were in December, when they passed a “sequestration replacement” bill that replaced all the defense savings with entitlement cuts. So you’re already hearing Republicans talk about ways to delay or alter the cuts, again. I’ve heard a number of current members make the point made here by the Ghost of Past Republican Failure. Yes. If the sequestration happens, it’s only a mere four weeks until Republicans have to pass a continuing resolution to fund the government. They can move the money around again. That takes another cannonball out of the cannon. Another one is being whisked away right now by Sen. Kelly Ayotte and Rep. Buck McKeon, who are schlepping the Down Payment to Protect National Security Act of 2013. It would replace the first year of defense cuts with austerity hiring freezes.